Thousands of processors, terabytes of data, and months of computing time have helped a group of researchers in Germany create some of the largest and highest resolution simulations ever made of galaxies like our Milky Way. Led by Dr Robert Grand of the Heidelberger Institut fuer Theoretische Studien, the work of the Auriga Project appears in the journal Monthly Notices of the Royal Astronomical Society. A composite of images from the simulation. (Left) Projected gas density of the galaxy environment about 10 billion years ago. Depicted are filamentary gas structures that feed the main galaxy at the centre. (Middle) Bird’s eye view of the gas disc in the present day. The fine detailed spiral pattern is clearly visible. (Right) Side-on view of the same gas disc in the present day. Cold gas is shown as blue, warm gas as green and hot gas as red. Credit: Robert J. J. Grand, Facundo A. Gomez, Federico Marinacci, Ruediger Pakmor, Volker Springel, David J. R. Campbell, Carlos S. Frenk, Adrian Jenkins and Simon D. M. White. Click for a full size imageAstronomers study our own and other galaxies with telescopes and simulations, in an effort to piece together their structure and history. Spiral galaxies like the Milky Way are thought to contain several hundred thousand million stars, as well as copious amounts of gas and dust. The spiral shape is commonplace, with a massive black hole at the centre, surrounded by a bulge of old stars, and arms winding outwards where relatively young stars like the Sun are found. However understanding how systems like our galaxy came into being continues to remain a key question in the history of the cosmos. The enormous range of scales (stars, the building blocks of galaxies, are each about one trillion times smaller in mass than the galaxy they make up), as well as the complex physics involved, presents a formidable challenge for any computer model. Using the Hornet and SuperMUC supercomputers in Germany and a state-of-the-art code, the team ran 30 simulations at high resolution, and 6 at very high resolution, for several months. 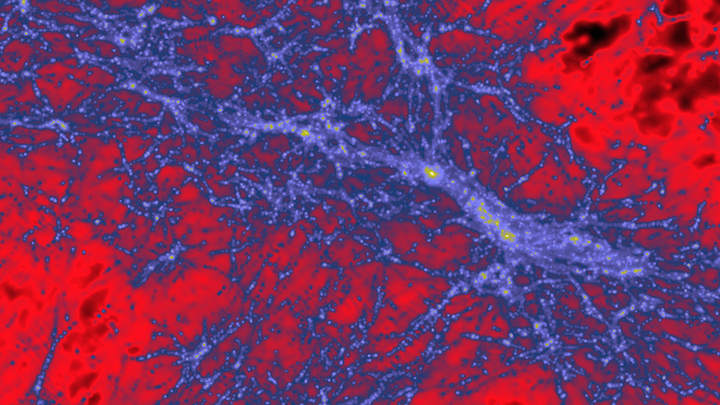 The dark matter density 500 million years after the Big Bang, centred on what would become the Milky Way. Red, blue and yellow colours indicate low, intermediate and high density regions. Credit: Robert J. J. Grand, Facundo A. Gomez, Federico Marinacci, Ruediger Pakmor, Volker Springel, David J. R. Campbell, Carlos S. Frenk, Adrian Jenkins and Simon D. M. White. Click for a full size imageThe code includes one of the most comprehensive physics models to date. It includes phenomena such as gravity, star formation, hydrodynamics of gas, supernova explosions, and for the first time the magnetic fields that permeate the interstellar medium (the gas and dust between the stars). Black holes also grew in the simulation, feeding on the gas around them, and releasing energy into the wider galaxy. Dr Grand and his team were delighted by the results of the simulation. "The outcome of the Auriga Project is that astronomers will now be able to use our work to access a wealth of information, such as the properties of the satellite galaxies and the very old stars found in the halo that surrounds the galaxy." The team also see the effect of those smaller galaxies, in some cases spiralling into the larger galaxy early in its history, in a process that could have created large spiral discs. Dr Grand adds: "For a spiral galaxy to grow in size, it needs a substantial supply of fresh star-forming gas around its edges - smaller gas-rich galaxies that spiral gently into ours can provide exactly that." The scientists will now combine the results of the Auriga Project work with data in surveys from observatories like the Gaiamission, to better understand how mergers and collisions shaped galaxies like our own.